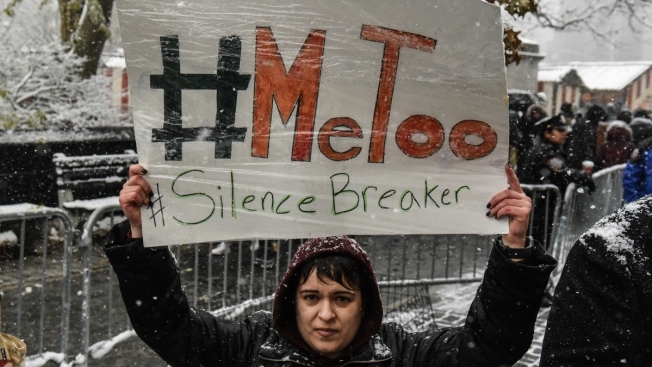 This Dec. 9, 2017, file photo shows a woman carrying a sign addressing the issue of sexual harassment at a #MeToo rally outside of Trump International Hotel in New York City. The wide-ranging allegations of sexual misconduct by powerful men has brought a new focus on the balance of power between the genders in the workplace. NBC News' THINK asked people across the country how the #MeToo movement changed how they interact with their coworkers. Some said their behavior was unchanged, but others feel like they can't or shouldn't say things they used to. One man who works at a New Jersey charity said he and a colleague had been handsy with each other in a way he'd assumed was playful. "When the #MeToo movement started, it made me reflect on basically every relationship I've ever had," he said, adding that he sat down with his colleagues to discuss how they felt about it.